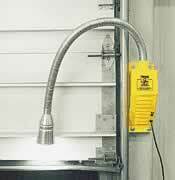 Versa Light | Southern Material Handling Inc. Proper lighting can increase safety and minimize product and trailer damage—saving you money! Versa Light’s® advanced technology illuminates the entire trailer. 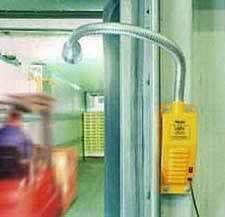 Its versatile multi-position flexible tube resists overhead door impact. Versa Light’s® computer fan cools the bulb for extended life. The difference between old technology truck lights and Versa Light® is like the difference between night and day! 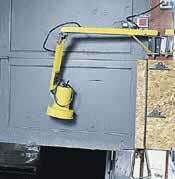 Old technology truck lights are prone to damage from overhead doors and fork lifts. Versa Light’s® unique flexible tube design withstands sudden impact, and easily adjusts to any position.